When it comes to food, I am undoubtedly a rice person (China-man mah!). And when it comes to the different varieties and preparation methods of rice, Nasi Briyani is undoubtedly ranked among the highest in terms of taste in my books. I am very fortunate to be working near one of the best Nasi Briyani stalls in KL, namely Tajudin Nasi Briyani in Medan Pasar. This humble little nasi briyani stall has been the ultimate GO TO place for workers around Medan Pasar. Located in a back alley, kindly disregard hygienic and comfortable surroundings if you plan to eat here but trust me, the food is absolutely to die for. The speciality here is their nasi briyani with fried chicken, which cost RM5. thats right, freaking 5 ringgit? Where to find in KL??? The meal comes with their signature smabal, which is smooth and sweet and not spicy at all along with fresh cucumber slices. I usually order a side of sambal eggs as well as I love some eggs with my lunch. The rice is very aromatic with a hint of saffron, and is really soft and fluffy, absolutely how good nasi briyani should taste like. The fried chicken here smells absolutely impressive. I suspect they use kampong chicken as the meat is lean yet tender, and of course very very juicy. Make sure you load up the fried chicken skins & flour leftovers or charcoal bits as I like to call them. heh. As for the smooth sambal, its definitely one of the best sambals I've ever tasted. The lack of hotness in this sambal compliments the rice really well without overpowering it. For those who prefers something with an extra kick, various curry sauces and extra hot sambals are available for you as well. Besides fried chicken, Tajudin offers a lot more choices of meat as well, such as mutton, quail, fish and squid. They also serve roti canai in the mornings too. 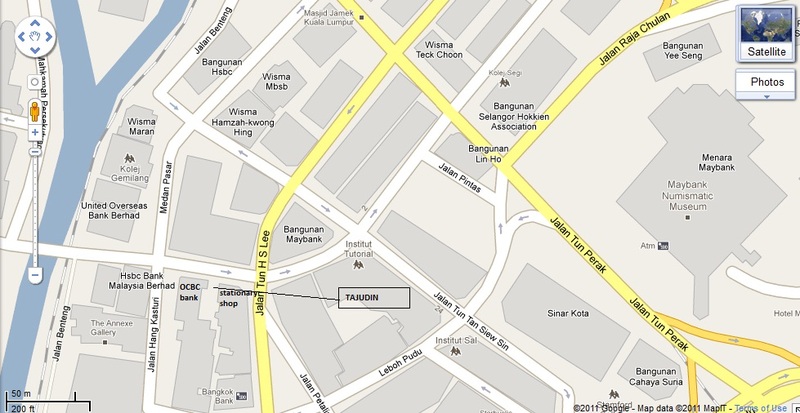 Tajudin is realy a great find in the middle of KL, offering great food which comes with modest pricing. I personally go there every single week for lunch. So note that parking is non existing there and its absolutely packed during lunch as there are less than 15 seats there. I normally go there around 12 or 3pm just to beat the lunch crowd. Here's a map for you readers. The place is really hard to locate if you are not familiar with the area. 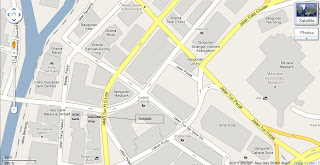 It's located between the old OCBC byuilding and a stationary shop, opposite a money changer shop. Look for the fruit stall facing the main road and Tajudin is just next to it. doggyjames says...a great hidden gem in the middle of KL, this warrants a place on my TOP 10 Malaysian makan places, you die die must try! looking at the menu price , do u notice that nasi putih and chicken cost rm 4.50 and nasi briyani with chicken cost rm 5.00. you said that "The rice is very aromatic with a hint of saffron, and is really soft and fluffy, absolutely how good nasi briyani should taste like." my dear friend, do u know how much does a 100gm of saffron cost ? My friend, do u kno how much saffron would u need to cook for 10kg of rice? actually the uncle has increased the price. It's no longer the RM5.00.